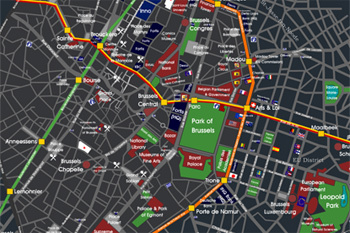 The historical centre (see Map of Central Brussels) is divided in 9 quarters; clockwise from the north-east corner : Libertés, Royal, Sablon, Marolles, Midi-Lemonier, Senne, Quais, Marais-Jacqmain and Centre. The old city walls around historical centre were replaced by an Inner Ring Road (R20), which also coincides with the line 2 of the metro. The names of the old city gates have survived in metro station names, like Porte de Namur/Naamsepoort or Porte de Hal/Hallepoort. The Brussels Capital Region is encompassed by the Outer Brussels Ring Road (R0). The east and south of the Brussels region have two additional partial ring roads between the R20 and the R0, namely the R21 (the boulevards running between La Cambre and Laeken, via Montgomery and Meiser) and the R22 (running between Uccle and Zaventem via Boitsfort, Auderghem and Woluwe). Although Brussels is geographically in Flanders, 70% of its inhabitants speak French and only 10% Flemish. 20% of the population speak non-native languages as their mother-tongue. English is the de facto 3rd language, due to Brussels' international character. 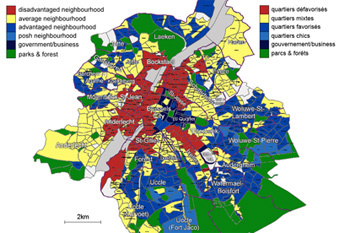 Brussels is a very cosmoplitan city, composed of 31% of non-Belgians and 6% of naturalised foreigners. The biggest groups of non nationals are French, Italian and Moroccan, but there is a great diversity of origins, thanks to the international institutions. Belgium is a federal country, made of juxtaposed geographic region-states (Flanders, Brussels, Wallonia) and linguistic community-states (French, Dutch and German), each with specific powers (e.g. economic matters are managed by the regions, while education and tourism are managed by the communities). One of the 3 region-states is the Brussels Capital Region, which also acts as the capital of the French Community of Belgium (Communauté française Wallonie-Bruxelles in French) and of Flanders (both Region and Community). All Flemish capital institutions are established there, from the Flemish Parliament to the Flemish government and its administration. As a result Brussels is officially a bilingual city, with all street signs written in French and Dutch, and often also in English. Being also an independent state, the status of the Brussels-Capital Region somewhat resembles that of the US District of Columbia, although in more complicated.